Very rarely does conservation news sound positive, but one such course of events is that of communities from villages in North East India coming together to save the Amur Falcon. Tiny birds of prey, the Amur Falcons make a brief halt in India every winter, on their arduous migratory flight from East Asia to Africa. After photographers documented the mass massacre of these birds at local markets in 2012-13, immediate and massive conservation action followed, and NGOs as well as forest departments worked tirelessly to spread information and awareness about the falcons. One such effort was led by Ms. Bano Haralu, managing trustee of the Nagaland Wildlife and Biodiversity Trust, along with Rokohebi Kuotsu, biologist Shashank Dalvi and Ramki Sreenivasan of Conservation India, in the Wokha district of Nagaland. In a place like Nagaland where hunting is prevalent even today, this was no easy feat to achieve, and several other regions which have witnessed hunting in the past have now taken a cue from Ms. Haralu's work, adopting conservation measures to save the birds. Amur Falcons are insectivores, preying on dragonflies in large quantities and offering pest control services to agriculture. To study their migration better, hunters and scientists came together in Nagaland, to capture and satellite-tag three of these birds. 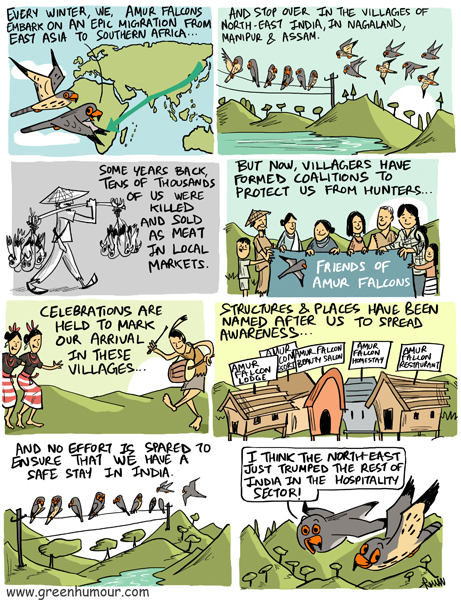 Recently, Pangti, a village in Nagaland erected a monolith to commemorate the arrival of Amur Falcons, and others in Assam, Manipur and Meghalaya have been conducting festivals to observe the occasion, which not only draw crowds of tourists and birdwatchers to the areas, but also ensure a safe passage of the tens of thousands of Amur Falcons that fly over North East India. If this could be replicated for all other wild animals that are still hunted in these regions, the North East could well be a conservation spearhead in the near future! Fantastic cartoon! And something to learn from where illegal hunting of migratory birds continues.